Voices in the Park uses story and imagery to tell the story of a shared space through the voices of four different characters. The differing perspectives of each very different character give a fascinating depth to this simple story which explores themes such as alienation and anger as well as friendship and hope. It gently explores the impact we have on others around us and the impact adult emotions have on children. A child reading the book shared with a class ‘The illustrator wants us to understand that we all change the world around us by the words that we say and the way that we are.’ This book is a resource that can be used at a variety of levels with learners young and old. Discussing simply what happens, and what learners notice about each page is an excellent place to start. Reading it several times over a number of lessons, with a different focus, enables learners to gain a deeper knowledge of the story and begin to grapple with more difficult, thoughtful discussion. Some learners will surprise us and jump straight to complex ideas! Ideas for using the book Voices in the Park by Anthony Browne to think critically about how we all live together. KEY QUESTIONS: How do we share spaces? Does a shared space mean we live together and see the same story? Voices in the Park uses story, imagery and even fonts to tell the story of a shared space (the park) through the voices of four different characters. It is a resource that can be used at a variety of levels with learners young and old. Discussing simply what happens, and what learners notice about each page is an excellent place to start. Reading it several times over a number of lessons, with a different focus, enables learners to gain a deeper knowledge of the story and begin to grapple with more difficult, thoughtful discussion. Some learners will surprise us and jump straight to the complex ideas! 1. Get learners to imagine who each character is speaking to, as they share their story. Where are they when they tell it, and what are they doing? This will help to build their ideas about the characters’ identities. Why don’t the adults talk to each other? Why do the children talk to each other? What experiences have these four people had before their day in the park? Would the two groups of people meet if they didn’t go to the park? Are these people part of the same community? What is a community – where does it begin and end? How do the pictures tell the story? How do the surreal objects link to the story? Why does the world look different through each person’s ‘eyes’? 3. Draw a map of the park and surrounding community. Imagine where and what other community spaces might be. Do you think all the characters would go there? 4. Write the story using a fifth voice, someone who has simply watched what has happened. How will you represent the different voices? How does your fifth voice compare with those of others in your class? How would you illustrate it? 5. Learners could write a newspaper article from four different perspectives. How would you use the narrative voice of the journalist to pull these voices together? 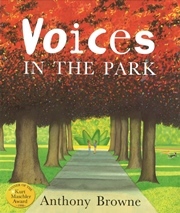 A link to an interactive copy of the Voices in the Park book that has been created by Books Alive, Kingston University. Five detailed lesson plans created to use with Voices in the Park. Including learning objectives, key questions, ideas for teaching and learning activities and recommended resources. 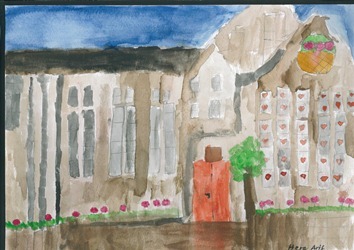 Watercolours produced by children in response to the book Voices in the Park. 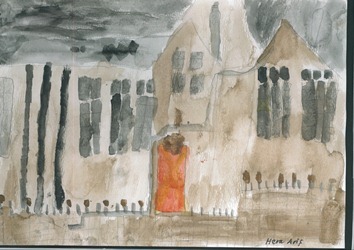 They were exploring themes of hopefulness and hopelessness. They painted the same picture in different colours. From Voices in the Park by Anthony Browne, published by Doubleday. Used by permission of The Random House Group Limited.